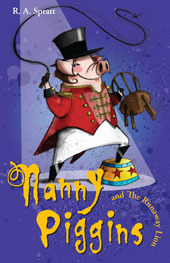 Meet the author of the Nanny Piggins books at the launch of the third book – Nanny Piggins and the Runaway Lion! Where: St Johns little church hall, opposite St Johns Church, St Johns Road, Glebe, NSW. You can chat with the author, Rachel Spratt, and hear a reading from the book. And there’ll be refreshments and activities including a chocolate treasure hunt. Head to the launch for a snorting good time!